Earlier this month, I had an opportunity to present at The Food Leaders’ Summit in Chicago. With an audience representing some of the leading players in the food management, marketing, research, and manufacturing industries, the summit addressed important issues, ongoing transformation, and technology innovations happening in the industry. For Dell, this was an opportunity to discuss our point of view on the Agriculture IoT space, as well as discuss our reference architecture to enable the Agriculture IoT ecosystem. Now, IoT is not new and although it is often framed as an emerging trend, it is not a future prospect. Many companies already have sensors on their equipment that allow them to do predictive maintenance. However, let’s take a step back. Here is our definition of IoT: it is an ecosystem where sensors, devices, and equipment are connected to a network, and can transmit and receive data for tracking, analyzing, and taking business actions. Agriculture industry has emerged as an early adopter of IoT and is experiencing significant success. According to the United Nations’ Food and Agriculture Organization, food production must increase 60% to be able to feed the growing population expected to hit 9 billion in 2050. The global food challenge necessitates that farmers find new sources of productivity. Now, Agriculture IoT is not new to Dell. 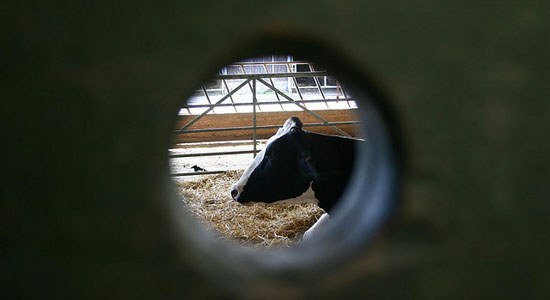 The Chitale Dairy case study is a perfect example of how Dell helped to improve the milk yield per animal by monitoring the feeding and breeding of animals through RFID sensors. But monitoring of cows with RFID tags and collecting the data was only the first step in realizing IoT benefits. Analyzing the vast amount of data produced about, for example, the food consumption, health records, and milk production of 6000 head of cattle, and making that information available to farmers via mobile devices is what helped farmers make better decisions in caring for their cows that led to improved milk yields. “We’ve transformed our dairy operations using technology, and the feeding and breeding of animals is now monitored by computers. By automating the collection of data from each farm, we have improved animal health, leading to increased milk yield per animal. We’ve also streamlined the efficiency of our distribution channels for faster delivery of our milk products to consumers,” says Vishvas Chitale, director, Chitale Dairy. Although the benefits of Agriculture IoT sound enticing, there are a couple of architectural challenges that need to be addressed before locking on a solution. Data Aggregation and Integration: Today, some equipment manufacturers are embedding connectivity into their products, such as fleet telematics solutions that allow farmers to track their machines and analyze sensor data in real-time to optimize crop yield and ultimately boost productivity. Other agriculture solutions like smart water metering, automated pest control systems, GPS, and weather alert systems are becoming more ubiquitous. Since none of these equipment or sensors runs on a standard protocol, one significant challenge is aggregating the data and normalizing it using a real-time data integration platform. Designing for analytics: Analytics-driven actions provide the real business value for the IoT solution, which is why starting any initiative with a clear understanding of how what it is you’re measuring impact your business is crucial. Once a data model has been established, and the relevant data are available for analysis, the natural next question is what useful things can be done with the data? At this point, it is important to identify specific issues or concerns that could be usefully addressed based on information and knowledge derived from the IoT data. Security: Many devices work on their own secure network, and solution providers/device manufacturers need to consider what security measures must be implemented for detecting and blocking malicious activity over non-standard network protocols. A natural starting point is to consider extending the existing firewall technologies to comprehend these new devices. Manageability: Many sensors won’t have the intelligence to be managed, so, in many cases, manageability can be solved using a gateway. Gateways can be used as a first aggregation point, as well as to condition the data, encrypt it, and determine what has to be sent over the network. 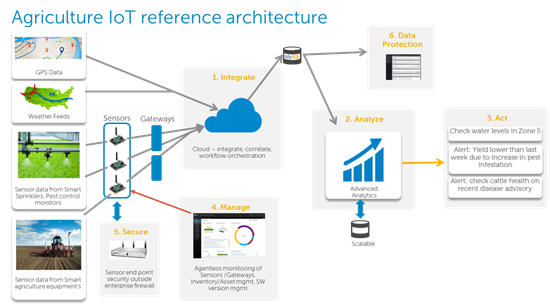 Of course, the overall process of managing devices, user access, and security can be achieved by extending existing datacenter systems management capabilities to these new sensors and gateways. An example reference architecture that comprehends some of these above considerations is shown below. To assist companies in overcoming the hurdles in setting up Industrial IoT technologies, Dell has set up the Dell Internet of Things (IoT) Lab. Companies can come to the lab – located in the Dell Silicon Valley Solution Center in Santa Clara, CA – to receive assistance in architecting solutions to their IoT problems. Cow image courtesy of Ian Hughes.